The instrument is now ready for the application of glazed coats of Madder Lake. The fingerboard which had been tacked on for the purpose of neck shaping, must now be removed. 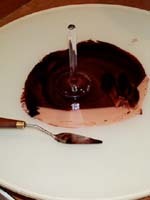 It is essential to wipehand after every pass at the glaze Using fingers to remove Glaze from corners.